Over the past few months, we have been creating an archive of advice for men concerning haircuts, facial hair and shaving, masculine gift ideas, and more. We’re definitely going to keep up the the suggestions from your favorite local barber shop, but for this week, we wanted to present you with a few men’s grooming tips that we think are worth bringing up again. How to Tell Your Barber How to Cut Your Hair – Guys tend to have a tough time describing what it is that they want their hair to eventually look like by the end of the haircut. Education is power, and learning how to tell your barber how you want your haircut is a great way to get exactly what you want or learn more about your hair type. What’s the Difference Between a Barber and a Cosmetologist? – Here’s a hint: Barbers are professionally trained for the majority of men’s hairstyles. That means if you have short hair and you’re a guy, you should see a barber for the best haircut. Treat Yourself to a Straight Razor Shave – Getting a straight razor shave from your barber is one of the most relaxing and masculine things that you can treat yourself to when you come in for a haircut, once a week, or more. The straight razor shave at the barber shop has a rich history behind it that you won’t want to miss. Should Men Use Hair Conditioner? – Lots of guys remember to wash their hair with shampoo, but forget or neglect to go through afterwards with hair conditioner. This article is all about hair conditioner and the benefits to using it. Tips for How to Get a Great Haircut – This is a very basic, but important list of ways to make sure that you get the best haircut experience possible when you visit the barber shop. 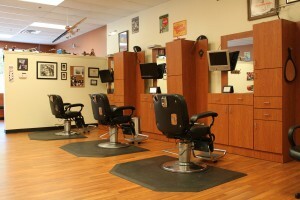 As we continue to grow, we will be adding new important information for all of the guys who visit the barber shop.